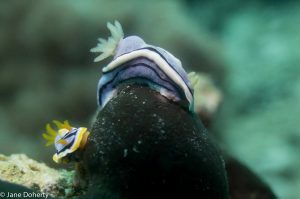 Here’s a dosage of slug action courtesy of Jane Doherty, Shona McKenzie and David Gilchrist who together with a happy band of divers, got overwhelmed by slugs! Thanks to them for letting me pinch these pics. These are all members of the DORID family, meaning they have branching external gills and obvious retractable Rhinopores (the feeler-type thingies on their “heads”), but that’s where the similarities between them end. Thanks also to Roberto Frattorola for the title image too. 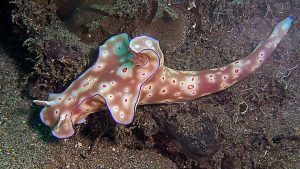 Chromodorids are usually very striking in their patterns, and the Magnificent Chromodoris certainly lives up to its name. As it is often found munching on bright orange sponges, perhaps this goes some way to explaining the vivid tangerine stripes? Lucky for us it doesn’t seem to go for brown or black sponges, otherwise we’d never find them on the rocks and sand! 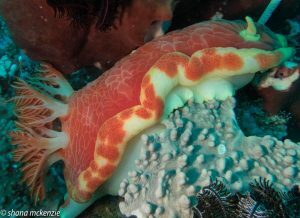 T-Bar Nudibranchs tend to get big, and this one was no exception. Most Dorid Nudibranchs propel themselves with a foot covered with thousands of tiny hairs, gliding along on a slimy mucus trail. It doesn’t sound like an ideal form of propulsion, but these guys can go anywhere, over any terrain, climb anything and eat nothing but sponge. Bear Grylls eat your heart out. The Mother of All Nudibranchs, the Spanish Dancer can grow to disturbingly large proportions, up to 60cm / 2 feet. Known for its flamboyant swimming style and scarlet skirts, it has been recently discovered that once they start swimming, they leave their slime trail behind and may have difficulty retracing their steps. So, if you see one swimming, enjoy the spectacle, but don’t force it to dance with you if it wants to sit this one out….it may not find its way back home once the music stops. 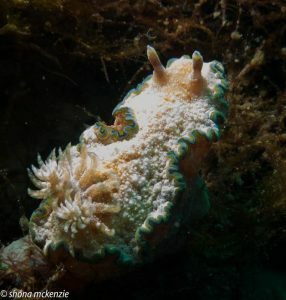 Glossodorids were first described by scientists over 150 years ago, and the name has been used pretty widely over the years to cover a lot of Nudis that actually weren’t closely related. Apparently this kind of thing can keep Taxonomists arguing for hours. Thankfully, modern DNA testing methods can now show which slugs belong to the genus Glossodoris, and this beautiful Girdled Glossodoris with a delicate blue fringe to its skirts is a prime example. 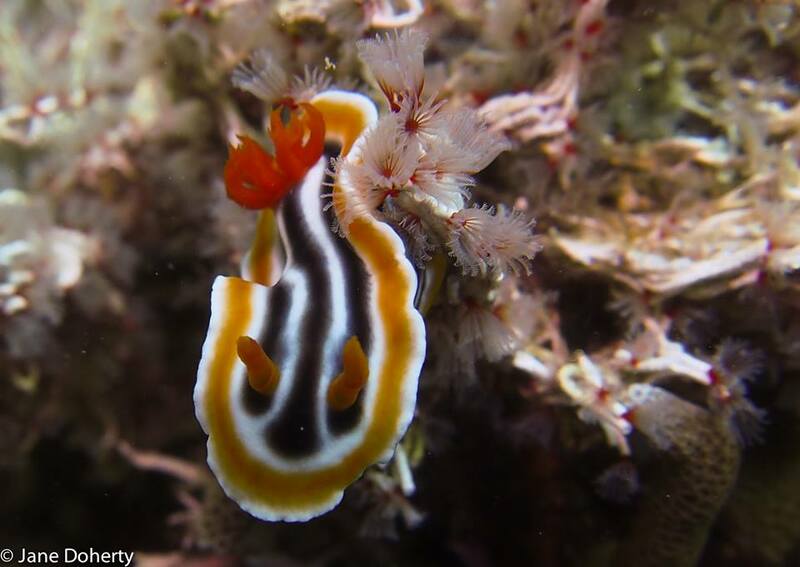 Willan’s Chromodoris was named after renowned marine biologist and slug-fancier Dr Richard C. Willan. Now there’s a pub quiz tie-break question for you. This one is being chased round a rock by Anna’s Chromodoris. They eat the same type of sponge, so maybe they were racing eachother to the dinner table? Slow down guys, the sponges aren’t difficult to catch! 9. 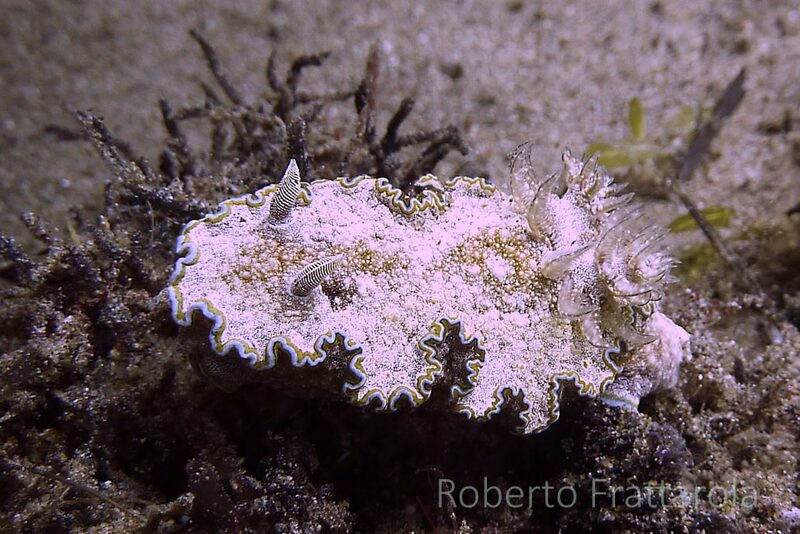 Cuttlefish Chameleons 7. Do you Nudi?